The barn was completely renovated in 2014 and upstairs it offers a new fully-equipped kitchen-diner and large lounge with vaulted ceilings and views over the surrounding countryside. Downstairs there are two bedrooms- a King and a twin, which can be joined to form a super-king bed on request. There is also a new modern bathroom with an extra-wide bath. Outside there is ample private parking, small garden and seating area. BBQ. Fernleigh Barn is situated on the edge of the owner’s small-holding and is run in an ecologically-responsible fashion. Central heating and hot water is supplied by a Biomass pellet boiler (Renewable heat generation). The electricity supply is from 100% renewable resources. High chair, travel cot and stair gate on request. Children are welcome. No pets. Outside tap for rinsing off beach things and surf boards/kayaks. Super-fast free WIFI. Welcome pack and photo book of local attractions. We run the holiday barn as part of our smallholding. We both work and have a family. We live on site so are available to solve any problems or give advice whilst you are staying with us. We however also want to allow you the privacy and peace to enjoy your holiday to its full potential. We pride ourselves on the welcome, quality of the property and the upkeep of the barn. We welcome feedback and are very keen to continue improving the barn and what we offer you. New modern bathroom with an extra-wide bath with shower over. Adjustable heating providing heat 24/7. Individual room radiator controls and the owners live next door and can adjust the overall temperature settings if needed. Super fast free Wifi with log on provided in the welcome folder on arrival. Vaulted spacious upstairs living room with views over surrounding countryside. Plenty of seating: 3-seater sofa, large arm chair and 2 swivel chairs. TV, DVD player, stereo. Wood-burning stove. Their is a private garden with private parking and gate that closes to the road. The outdoor furniture and close proximity to the smallholding animals makes this space feel personal and private and part of the holiday experience. Although we were not blessed with the same lovely weather experienced throughout the rest of this summer we thought this location was perfect to be able to explore Cornwall. It really is only 15 minutes to either the surfing beaches on the north coast or the beautiful quiet bays on the south coast. 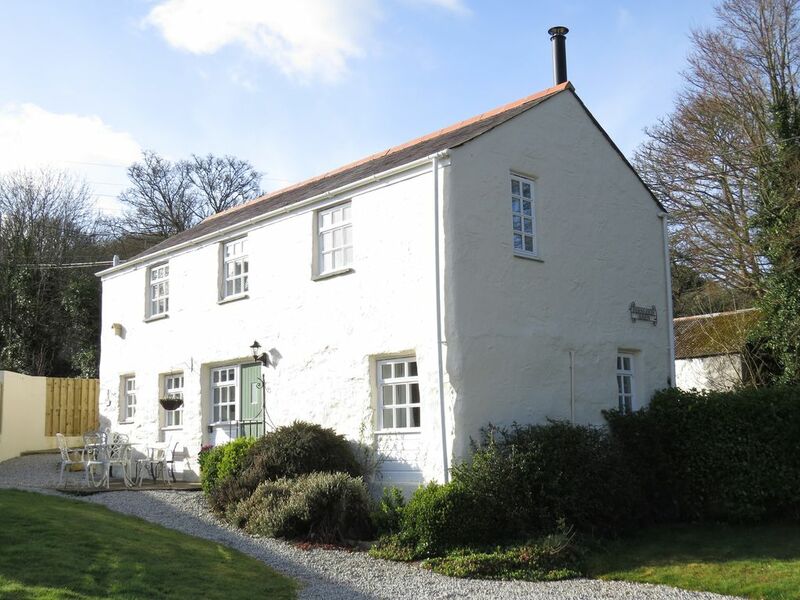 The cottage itself is lovely and there is plenty of room to sit an relax whilst the hosts made us so welcome and were available if we had any queries without being intrusive at all. As this was our first visit to Cornwall we feel we have unfinished business with so much more to see and do and will certainly be back and would love to stay here at the Barn again when we return!! Many thanks for your lovely feedback. We are delighted you enjoyed your stay and wish you all the best with your year ahead. We have stayed here multiple times because it has a mix of spacious rooms, a quiet location and is well equipped. The bath is the best after a long day sightseeing, bodyboarding or walking and the beds are comfy too. Nice spot to look out over the fields and also for coast to coast bike trail. Many thanks for your kind feedback. We'd love to host you again. Have a great year. Al and Gabi. Fernleigh Barn was the perfect base for our explorations of Cornwall this summer. The cottage itself is a real delight - beautifully furnished to feel light and airy but cosy and friendly at the same time! It is well equipped, making it a proper 'home from home' and our hosts, Alastair & Gabi provided a really thoughtful welcome (we particularly valued the photo album full of personal recommendations of places to visit). We genuinely have no hesitation in wholeheartedly recommending this property. Many thanks for you kind and constructive feedback. We would be delighted to host you again. Thank you for time in providing us wit this feedback. We had a wonderful weeks stay at the charming Fernleigh Barn, the cottage is set in such beautiful surroundings, it was a perfect rural idyll. The cottage itself was welcoming and so comfortable, we couldn’t have wished for more. Alaistair and Gabi were so lovely and helpful, we will definitely be coming back for another stay in the future. Many thanks for your kind feedback. We would be delighted to host you again. Great location, warm and welcoming home. Beautifully modernised this really is the most perfect cottage, we were so sorry to leave. Excellent quality furnishings and equipment, everything in the kitchen you could ask for, all in matching sets. So quiet, yet very convenient for Truro and all that area of Cornwall and the Blissoe bike hire is less than 5 minutes walk down the lane. Will suit a family of 4, 2 couples or just one couple wanting plenty of space! Our hosts were there if we needed them but their house and the cottage are completely private. We will be returning soon. There is nothing we could improve. Many thanks for your very kind feedback. We strive to make this feel like a home we would want to live in ourselves. We are pleased you enjoyed your stay and would love to host you again in the future. The barn is centrally positioned half way between the north and south coasts. Falmouth on the south coast is 15 mins drive as are most of the north coast beaches. We also are located half way between Truro and Falmouth and can easily access both with a local train line and easy road links. CHECK-IN TIME is AFTER 3 P.M. AND CHECKOUT is 9 A.M. This is a strictly NON SMOKING property. PETS are not permitted A security deposit of £100 is required. This must be received within five (5) days of booking the holiday property. The deposit automatically converts to a security/damage deposit upon arrival. The deposit is NOT applied toward rent; however, it is fully refundable within (14) days of departure, provided the following provisions are met. •	No damage is done to property or its contents, beyond normal wear and tear. •	No charges are incurred due to illegal activity, pets or collection of rents or services rendered during the stay. •	All debris, rubbish and discards are placed in rubbish bin, and soiled dishes are placed in the dishwasher and cleaned. •	All keys are left on the keylock and unit is left locked. •	No linen is lost or damaged. •	No early arrival or late departure. Nothing has blocked the septic tank plumbing. •	The renter is not evicted by the owner (or representative of the owner) or the local law enforcement. An advance payment equal to 50% of the rental rate is required at booking. The advance payment will be applied toward the rent. The advance payment is not a security deposit. The BALANCE OF RENT is due thirty (30) days before your arrival date. CANCELLATIONS - A forty (40) day notice is required for cancellation. Cancellations that are made more than forty (40) days prior to the arrival date will incur no penalty. Cancellations or changes that result in a shortened stay, that are made within 40 days of the arrival date, forfeit the full advance payment and reservation deposit. Cancellation or early departure does not warrant any refund of rent. The maximum number of guests is limited to four (4) adult persons. Young children could be in addition to this if the guests are prepared for the children to not sleep on one of the beds provided. No additional guests are permitted without prior discussion with the owners.